Shopping "experiences" like those Rick Caruso has developed in Los Angeles certainly give locals a lot to grouse about, but aside from the perils of modern living (see: Muffin tops, American Girl, and Uggs), these outdoor hyper-designed environments aren&apos;t anything new. Of course we can go back hundreds and hundreds of years and note that shopping outdoors in a village-esque atmosphere was a way of life—mainly because you lived in that village—but we can also go back to the 1930s to look at was once a glorious architectural and entrepreneurial vision that was much celebrated right here in LA. 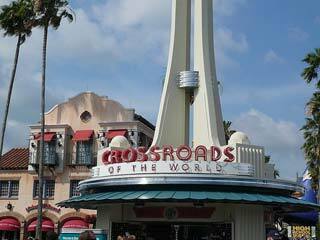 Situated at 6671 Sunset Boulevard in the part of town we can&apos;t help but call Hollywood, The Cross Roads of the World was built in 1936 and designed by Robert V. Derrah. Iconic if only for its cheery neon sign and the heavens-bound 55-foot spire topped with a globe, those of us who have ever just whizzed by in our cars with no reason to stop might not have realized that its oddly-shaped central building is in fact the core component unifying all the neighboring buildings on the block. Go around the block (it stretches from Sunset to Selma, with an entrance off Las Palmas), or get out of your car and get close-up on foot to really take a gander--and you&apos;ll notice all the different styles of buildings here at the Cross Roads. The central building with the spire isn&apos;t so much just rounded, but rather is actually styled and built like a cruise ship. It is done in what is considered the Streamline Moderne style, which is according to ArtSlant, "a late branch of Art Deco, that put an emphasis on curving forms, long horizontal lines, and oftentimes nautical elements." The 1930s was considered the "Golden Age of Travel" and sea voyages on big, beautiful, sleek ocean liners highly romanticized and often evoked in the art and architecture of the time. Maybe you&apos;ve seen this "Nautical Deco" style before--like the Coca Cola Headquarters here in Los Angeles, which just happens to have been designed by Derrah, around the same time he did the Cross Roads. The out-buildings, however, are not sea-faring, but rather are done as a sort of global tribute to architecture, emulating "a European Village with Spanish, medieval, English, Oriental, French, and Cape Cod styles" (De Wolfe 2). It was imagined by its creator, Mrs. Ella Crawford, as being an experience like "taking a trip around the world" that would serve as "a cultural [and] business center" (De Wolfe 2). 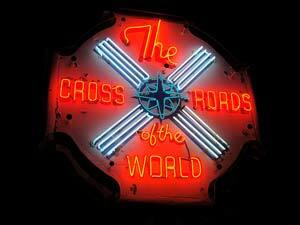 But what on earth is--or was--the Cross Roads? Some people like to call the Cross Roads of the World Los Angeles&apos; first shopping mall, but then they&apos;d be neglecting Downtown&apos;s glorious Mercantile Arcade building, which opened for business in 1924. (It&apos;s now being remodeled and repurposed as residential lofts, natch.) 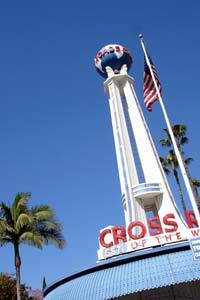 But Cross Roads was indeed a shopping mall. In fact, as planned, the "structures were originally designed with bay windows to enhance the display of the merchandise and to appeal to the pedestrian, with inviting entry ways and system of walkways that tied the complex together in a smooth transition from one country to another," (De Wolfe 2). While the Cross Roads was a spectacular shopping complex and tourist attraction, how it came to be is very curious. Mrs. Crawford was the widow of an infamous man named Charles Crawford, known as anything from a prominent West Coast brothel and casino operator nicknamed "Goodtime Charlie", to "the Gray Wolf of Spring Street," to a prominent local politician, to an organized crime boss, or as the "model for some of Raymond Chandler&apos;s juicier villains" (Rasmussen). According to a detailed articled about Crawford by Cecilia Rasmussen published in 1999 in the LA Times, "[Charles Crawford&apos;s] notorious viciousness and cunning helped take public corruption to a new level in Los Angeles city government in the 1920s." Crawford, however, became most well known in 1931 as a corpse; he and newspaper man Herbert Spencer were shot and killed by former Deputy District Attorney David Clark. The incident took place in Crawford&apos;s real estate office, which just happened to be located at 6665 Sunset Boulevard. The murders and Clark&apos;s trial were major headline fodder in Los Angeles in 1931. Prosecutors were having one hell of a time pinning the rap on Clark, as well as finding witnesses or people with information about the crime. At his trial, Clark testified that both killings were in self- defense. Spencer was angry with him, he said, for using his judicial campaign as a platform from which to hammer those involved in local vice and graft. Aware of the bad feeling, Crawford had attempted to act as a peacemaker and invited Clark and Spencer to meet in his office. Fearing a trap, Clark stopped and bought a gun, overdrawing his bank account to make the purchase. At the meeting, Crawford tried to make a deal with Clark, asking for his help in framing the police chief and assuring him of a victory in the coming election. But when Clark refused and threatened to expose him, Crawford pulled a gun. Clark responded by drawing his own newly purchased weapon and shooting both Crawford and Spencer to death--or so he testified. Mrs. Crawford was present in the courtroom when Clark was acquitted, but had no comment to make. According to Ken Schessler’s West Hollywood Babylon, the Clark trial had another claim to fame, because it was the first use of microphone during a trial in the state of California. Clark, for the record, ended up killing again in the 1950s--this time "a good friend&apos;s wife"--and "a few days after his arrest, he died in the county jail of a heart attack." Many speculate that following the trial, Mrs. Crawford&apos;s wish was to wipe away the negative taint of her husband&apos;s former office and the scene of his murder, as well as his long-standing nefarious reputation, by replacing it with something pleasant and attractive that would draw people in. The result was the Cross Roads of the World. By the 1970s, the Cross Roads had largely fallen into a sad state of disrepair. Cross Roads was purchased in 1977 by Morton La Kretz (whose generous donation to his alma mater, UCLA, allowed for the construction of their La Kretz hall recently) It was "such a mess," according to La Kretz, speaking about the lengthy and difficult restoration process the complex underwent for nearly 3 years following the purchase. In a 1986 LA Times article about the building&apos;s 50th anniversary, La Kretz&apos;s daughter Margaret explained "When we purchsed the property, it was badly run down with tenants living in the offices, people sleeping the hallways. It took us about three to four years to upgrade it" (De Wolfe 2). La Kretz&apos;s purchase ostensibly "sav[ed] it at the auction block from developers who wanted it for high-rise construction" (De Wolfe 1). At the time, it seems vestiges of Hollywood&apos;s Golden Era that had fallen into under-use (or misuse) were beginning to appear as blights on the landscape, and developers had a different vision for Hollywood--one which, if we fast forward to closer to Cross Roads&apos; 70th anniversary in 2006, seems to have been realized, but only in partnership with preservation. 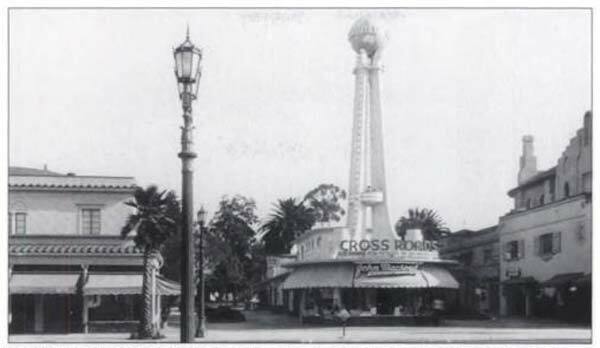 Cross Roads was described as being "dilapidated and deserted" and of no interest to anyone in the 70s, and it took a lot of time and money for La Kretz and his daughter to bring back to life (Simross). It earned a second life as office space, housing over the years a variety of tenants, including the Hollywood Arts Council, fashion and entertainment industry businesses, and sound and recording outfits, and the religion of Eckankar, among others. 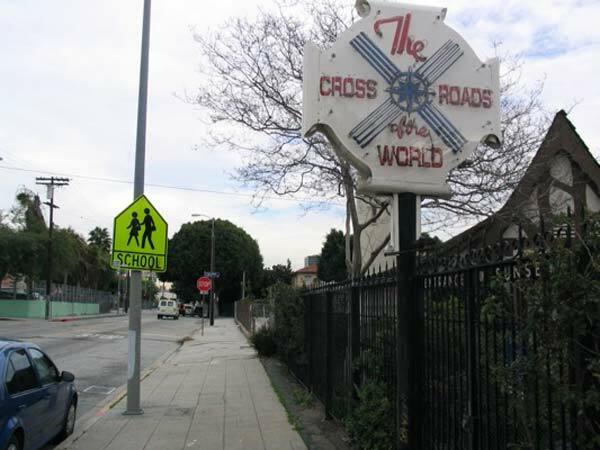 In the early 1980s Cross Roads was "listed on the National Register of Historic Places and [had been] previously elected a Los Angeles Historic Cultural Monument" (DeWolfe). On the backlot of Disney&apos;s California Adventures, you might notice one of the many Los Angeles-inspired buildings is from the Cross Roads, or spot the replica at Disney&apos;s Hollywood Studios in Florida (Yesterland). Further cementing its role in local lore was its multiple use in film and television shoots; combined with its other legacies and restored charms, still reliant on the once-upon-a not-so-pretty-time lore of its origins, Cross Roads still finds itself associated with the darker side of Los Angeles. 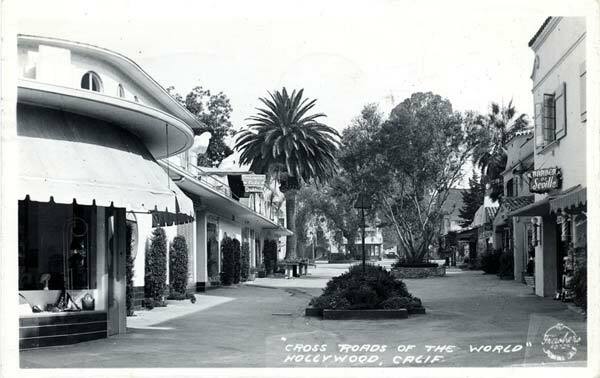 As Rasmussen explains:"Despite Ella Crawford&apos;s efforts to erase the horrifying crime scene and her husband&apos;s thuggish image, Cross Roads of the World--a 2 1/2-acre make-believe oasis with a sultry allure--is today best known as one of the locations for the film noir hit L.A. Confidential." Rasmussen, Cecilia. "Mall Is Legacy of &apos;20s Crime, Corruption." LA Times Oct. 3, 1999. Simross, Lynn. "Hollywood: Building the Reality While Rebuilding the Dream." LA Times Nov. 9, 1980.